Which part of the Niseko winter season is best for you? Choosing the right time to go skiing in Niseko is one of the biggest considerations for anyone planning a trip. Niseko’s reputation as a haven for powder lovers is well-known, but to ensure the best conditions (or the most suitable) requires some careful planning. There are a number of factors to take into account including cost, snowfall, crowds and availability of accommodation, and when all of these are considered it is easier to make an informed decision – one that could ultimately make or break your holiday! We’ve broken down Niseko’s season into 5 distinct periods – opening season, early season, peak season, shoulder season and spring. A rare sunny day in Niseko in late February, 2015. Niseko United resorts typically schedule their opening for a date in late November, but it is becoming increasingly rare for the resort to open on time. Niseko Grand Hirafu advertised a November 23 opening date for the 2015/16 season, but there was not enough snow to get the lifts spinning until December 1 (and even then with limited operations). In the two years prior the opening dates were December 6 and November 30 respectively. It therefore goes without saying that going to Niseko during this period is a huge gamble but, nonetheless, one that can pay dividends if you get it right. Hotels are almost empty and typically heavily discounted, the slopes are virtually empty and restaurants and bars take walk-ins (no reservations), which is a rarity in Niseko. So book this period, but do so with caution. If mother nature doesn’t play nice then you may find yourself spending your days in the onsen, the spa, the restaurants and the bars. Maybe not such a bad idea after all! Pros: Cheaper accommodation (up to 50%), restaurant and ski school availability, no crowds. Cons: Limited lift operations or total closure, some restaurants & bars not yet open, unpredictable weather, limited or no off-piste riding due to low coverage. Best for: A budget-conscious skier prepared to take a gamble and get it wrong. Early season in Niseko is more reliable than the opening period in terms of snow, but still offers visitors many of the benefits that come from a pre peak period holiday. Restaurants and bars are generally not too crowded, local snow schools have availability and mountain lift lines are short or non-existent. Accommodation is typically also cheaper, with discounts and specials very common. In addition, nearly all of the Niseko businesses will be open by this stage. Early season will also start to see some of the epic powder conditions that Niseko has built its reputation on, though coverage may still be an issue in some areas of the resort, particularly early on in the month. During the 2014/15 season, December had 560 cm of snow with more than 325 cm coming from the first 20 days of the month. Pros: Uncrowded, availability of accommodation, discounts/special offers, heavy snowfall, businesses open. Cons: Often limited snow coverage off-piste or in the backcountry, few sunny days. Best for: A budget conscious skier looking to maximise the chance of good snow conditions without the peak period pricetag. If you’ve seen one of the many thousands of videos and photos of riders charging through chest-deep Niseko powder, there’s a strong chance it has been captured during this period. 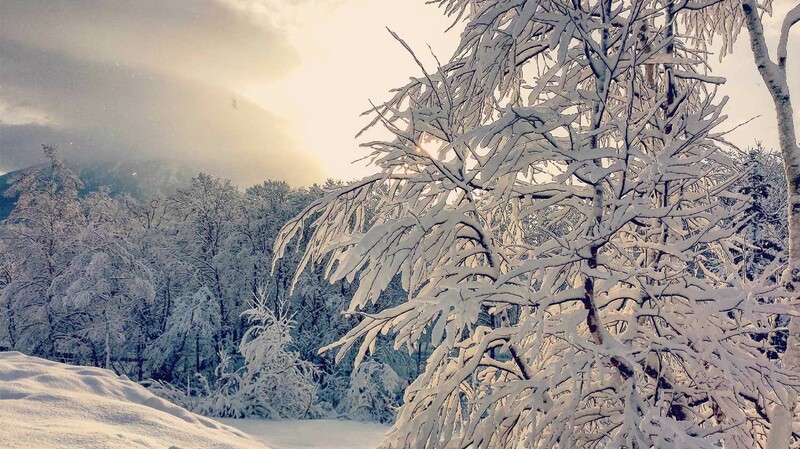 Niseko’s snow is famous for a reason, and a good chunk of it falls between these dates. In addition to phenomenal snow, there are a few others reasons to consider this period. Backcountry access via Niseko’s gate system is open, businesses are all running and night skiing is in full swing. There’s also a great buzz around the village, as skiers from all over the world arrive to see best of what the Japanese winter has to offer. On the flip side, this time of year also sees the largest crowds (particularly over Christmas, New Year and Chinese New Year), which means longer lift lines, higher accommodation prices – which are often booked out months in advance – and bars and restaurants which are packed to the rafters (don’t leave your reservation to the last minute). And all that powder snow? You’ll be competing for fresh tracks with hundreds of other riders on the mountain, so instead of hitting the snooze button in the morning, you’ll need to be up and ready for first lift. If snow quality and quantity are the only things that matter to you, then peak season is your best bet. If you’re on a budget, a beginner skier, or someone who appreciates a sunny day every now and then, you might be best off considering one of the other periods. Pros: Powder snow (lots of it), backcountry access, night skiing, nightlife. Cons: Crowds, 30–50% more expensive, very few sunny days, restaurants need reservations well in advance. Best for: A powderhound with deep pockets. Peak season in Niseko is known to get some of the biggest snowfalls on the planet! This is Boxing Day, 2015. Shoulder season in Niseko is the resort’s best-kept secret. Good snow conditions, fewer crowds and sunny days make it a wonderful time to visit the area, particularly if powder skiing is not your one-and-only focus. That’s not to say shoulder season powder days are non-existent; in fact, there’s nothing further from the truth. Late February and early March often get significant snowfalls, though they are less frequent than during peak season. Increased temperature variation during the day can also affect the quality of the snow. If you’re a beginner or intermediate skier planning to spend more time on piste than off, there’s truly no better time to come. Milder weather (most of the time) can make for very pleasant days on the slopes, lift lines are short and there’s no jockeying for tables over lunch. Better still, you’re more likely to get the classic Mt. Yotei view – a sight that peak season holidaymakers often completely miss out on. Pros: Cheaper accommodation, great snow/conditions, sunny days, fewer crowds. Cons: Slightly wetter, heavier snow, fewer powder days. Best for: Beginner or intermediate skiers looking to avoid the hustle and bustle of peak season. Are you a sucker for blue skies, warm weather and relaxed piste skiing? This might just be the time to head to Niseko. It’s a very different experience from the one you’ll find mid-January, but that’s not necessarily a bad thing. Empty slopes and a laid-back vibe make spring skiing very appealing, but you’ll need to contend with the fact that the snow quality won’t be as good (generally heavier and wetter) and even the chance of rain. For advanced skiers, an aspect of spring that is often overlooked is the abundance of challenging mogul fields. The Super Bumps Niseko Cup is an event held in early April each year, and attracts some of the top riders in the region. Other major benefits of skiing this time of year include cheap accommodation, discounts on services and restaurant availability. You might even find yourself in Japan for the stunning cherry blossom season, which generally hits Hokkaido late April to early May! Pros: Sunny skies, mild weather, moguls, few crowds, cheap accommodation, discounts on services. Cons: Heavier, wetter snow, occasional rain, businesses begin to close for the season, closure of some lifts and resort services. Best for: Fair weather skiers, bargain hunters and beginners.